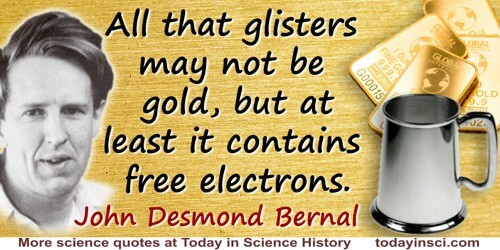 Irish physicist and X-ray crystallographer whose contributions to X-ray crystallography enabled determining the atomic structures of solid compounds. He also engaged in research in molecular biology and the origin of life. He also investigated the structure and composition of the Earth’s crust. In England, more than in any other country, science is felt rather than thought. … A defect of the English is their almost complete lack of systematic thinking. Science to them consists of a number of successful raids into the unknown. The Social Function of Science (1939), 197. Men will not be content to manufacture life: they will want to improve on it. The World, The Flesh and The Devil: An Enquiry into the Future of the Three Enemies of the Rational Soul (1929), 56. Published papers may omit important steps and the memory of men of science, even the greatest, is sadly fallible. Science and Industry in the Nineteenth Century (1953), 199. The beauty of life is, therefore, geometrical beauty of a type that Plato would have much appreciated. The Origin of Life (1967), xiii. 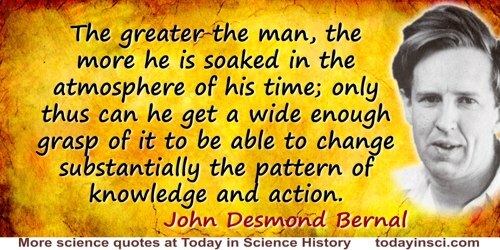 The greater the man, the more he is soaked in the atmosphere of his time; only thus can he get a wide enough grasp of it to be able to change substantially the pattern of knowledge and action. Science in History (1954), 22. 10 May - short biography, births, deaths and events on date of Bernal's birth.